Feb-118 White/Green Reverse "Produce" Labels for the 1110® Labeler. Each sleeve contains 16 Rolls of 1,063 labels. 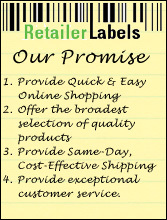 You receive 17,000 labels per sleeve.